People are growing their own food in bigger number than ever before. In urban areas this trend is surging, particularly in multifamily communities. These communities include apartments and condominium associations. It enhances the sense of community and increases property values. An NYU study in 2006 (the last one we saw) found that regardless of the neighborhood’s income level, property values increased up to 9.5 percent. 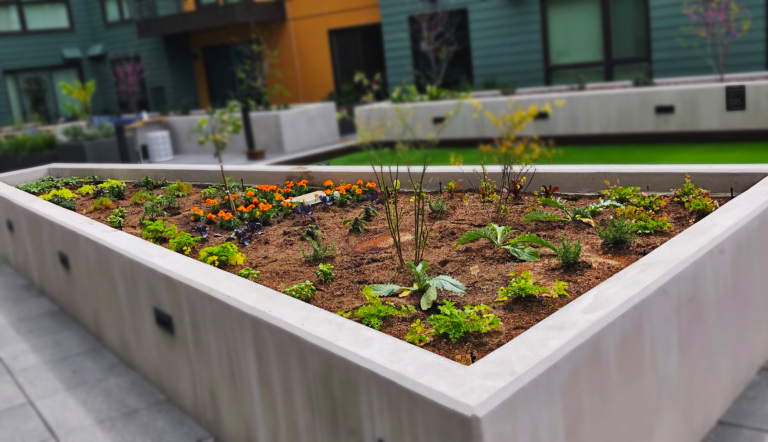 This month we’re talking about a client garden in Oakland and the reasons for its success. It’s one thing to start a garden. But, maintaining it requires a different set of skills, knowledge and time. We’ve distilled the success of this multfamily’s garden to these two factors. How they are maintained. It’s actually not the how – but who. Their vegetable garden pictured above is maintained by someone outside of the multifamily community. 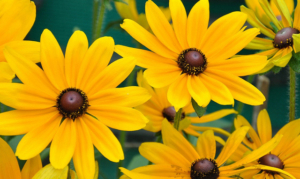 Gardeners’ Guild performs the maintenance, but it doesn’t have to be us, or any company. It can be one or two people. The key to its success is that the gardener is outside of the community. It’s a cleaner relationship. No entanglements with the community. See our explanation below. Fundamental for plant survival is – the right plant/right place; soil and proper amount of water and light But that’s not everything. This is especially relevant for urban multifamily housing like homeowner’s associations or apartments. Many of these residents are super busy and don’t have time to maintain a garden. Yet these urban communities recognize the benefits of an edible garden. It is convenient. Healthier and less expensive. The realities of plant maintenance, however, can sometimes undo all the hard work of planting an edible garden. We’ve seen it happen. Plant problems occur. The solution rests on a board or committee burdened by multiple priorities. Sometimes there is disagreement among the group on a solution. The garden may suffer. When the maintenance is done outside the community it takes all the guesswork, planning and scheduling off the shoulders of residents. They can enjoy their edibles without being pulled into the work of managing them. Some residents and/or committee members may be horticultural experts, equally experienced with maintenance. However, if they don’t have the time, or have conflicting loyalties, it could impede the garden’s success. Develop a garden maintenance scope of work that includes these basics. Watering – either with irrigation or hand watering. Keep in mind hand watering takes more time and will cost you more. If irrigation, make sure your gardener understands how to program and troubleshoot problems. Pruning – excess foilage helps direct their growth, let in light and helps protect from disease. If they become overgrown it is harder to access air and nutrients. Thinning -this is important so that each plant has sufficient space to grow and mature. Fertilizing – type of fertilizer and frequency will depend on the plants. Monitor for pests. One of the most importanta components of managing pests – is monitoring. Composting. As a top dressing. This will keep the soil healthy. Set and adhere to timelines for making your decision and for a start date. It’s a new association in Oakland. We recently planted strawberries, marigolds, artichokes, parsley, cilantro, and lettuces. Below is a snapshot of how to grow them. When to plant depends on the variety. 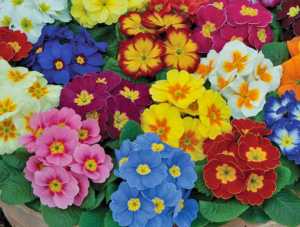 Some can be planted in February through early spring. 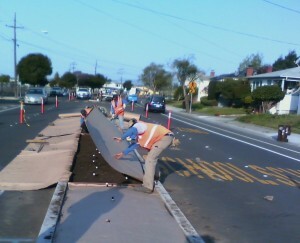 Soil that drains well and they prefer acidic soil, but will grow in others. Notes They are happier when planted in the ground rather than containers. Where to plant They like cool coastal climate. 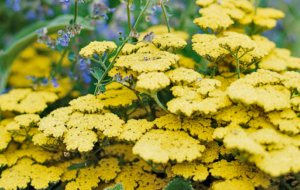 In a hot dry area you can plant them in partial shade. When to plant Early spring or late fall. Where to plant near your kitchen. Light 6 hours of sun daily. Soil Any kind, but must drain well. FertilizationContainer plants will need more frequent fertilizing. Water Keep soil evenly moist. Notes Harder to grow by seed. Best to purchase starts from a nursery; they are a biennial. When to plant Depends in the type. Early spring or fall, but can be grown year-round. Best grown by transplants. Soil Loose soil that drains well. Fertilization Adequate nitrogen. Adding compost will improve growing conditions. Notes Harvest in the morning. It will be crisper. 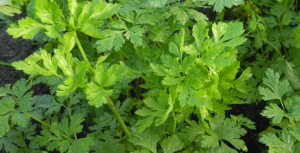 If your apartment or homeowner’s association is in an urban part of the San Francisco Bay area, you may choose to have residents take on the care of your edible garden. It may be a big success and enhance the social interaction between residents. Or, your multifamily community may opt to have an independent contractor maintain your garden for reasons discussed above. Whatever you do, let us know about your experiences. We notice some landscape trends return year after year. They remain on the list because their popularity is still soaring. Like edible and community gardens. These two are big – and encouraging. More people are embracing plants – indoors and out. Millennials are spending a lot of money on plants. And, Generation Z – loves them! Gardens that save water, benefit the environment, are low maintenance and – gardens that heal and feed. They are everywhere. Not just in the west. More hospitals and institutions are incorporating gardens. Since we know that gardens can heal the mind and,the body, Horticultural therapy is a increasingly recognized profession. 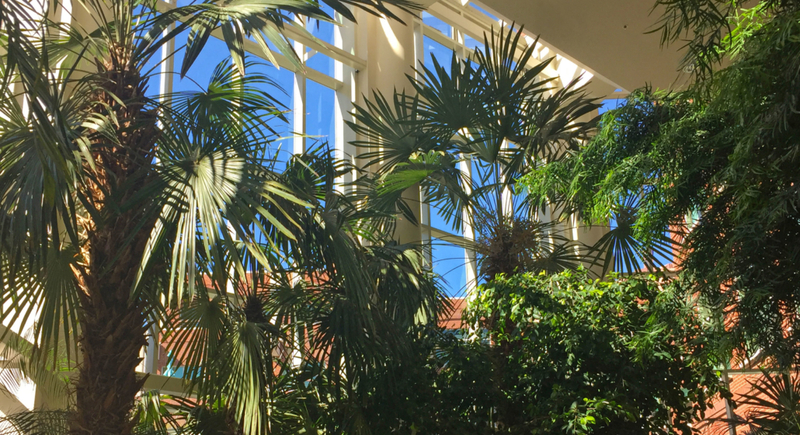 How plants help in institutional settings. From Garden Media’s annual report. Pinterest searches for indoor plants are up 90 percent. National Gardening Association found that 30 percent of all households bought at least one hourplant last year. Millennials are driving this trend – they represent 31 percent of houseplant sales. People who spend a lot of time indoors behind a screen are craving nature. Bringing the outdoors in – is a no-brainer. One organization in New Zealand has identified how apartment dwellers are using plants in their homes. Putting “masses of indoor plants on modular shelves.” Aranged for easy maintenance. At home they are not using living walls – too high maintenance. See our website for photos of the above plants and others we use in our service. *Bill Wolverton, former NASA research scientist who conducted the 1989 plant study favors golden pothos. He suggests placing two good sized plants per 100 feet of interior space. He reminds us that they make people feel happier, reduce stress, improve mood and energy levels. Sustainable design and bringing nature inside was once a new trend. Now these concepts are the standard and essential for attracting talent. It’s called “Biophilic design”. Designers also integrate views, natural lighting and climate to mirror the outdoor environment. Big picture, sustainable buildings are just one aspect of what is called – healthy buildings. Spaces are being designed with the employees’ well being in mind. One example is relaxation or quiet spaces, featuring soft and comfortable seating; mini fridges. The Trust for Public Land says this trend has grown 44% since 2012. 22% since last year. Most community gardens grow edible plants. The biggest way they make a difference is by providing low cost healthy food for underserved communities. It’s hard to envision living in an area without a major grocery store – independent or chain. But, that is a reality in Richmond. Verde Elementary is a small school at the end of a quiet street in Richmond. It has one of the oldest organic school gardens in California. Urban tilth managed it for eight years. It is a food source for the students and the North Richmond community. The program includes teaching students about health and nutrition plus, it gives them the experience of tending a garden. There are many community gardens throughout the bay area. Below is a partial list. Rodgers Ranch Community Garden – Pleasant Hill. This garden rents different sized spaces for an annual fee. As the conversation about climate change goes mainstream, a broader swath of the population are realizing they can help make a difference – in their own gardening practices. The term resilience – is being used by Gensler (architecture and design firm). It’s in the context of – urban centers and their potential to become part of the solution. Now individuals are taking more responsibility by embracing gardens that enhance biodiversity. Gardens are trending toward a less manicured look in favor of a more natural appearance. Adding plants that attract butterflies and other pollinators. Edible gardens have become wildly popular. And, water. We can no longer take it for granted. Drought tolerant plants are the standard. Irrigation technology, including weather-based irrigation timers, (controllers) has exploded in popularity. This relieves the busy homeowner from having to remember to water. And, it is more effective. We list the names of SF Bay area water districts offering rebates for some of these products. Soil moisture sensors help by measuring the amount of moisture in soil. Plant ID/Gardening apps are proliferating. However, I have yet to find a good one. Robotic weeders. Solar powered. It can weed whack for up to three hours. (This is all we know at this time). Robotic pollinators. They are being tested. Results show they have been successful in flowers. Rose Pruning is Easier Than You Think! Our tips and tools give you all the basics to make it easy. We tell you when and how. Plus advise you on the best tools to make it safe. And, easy. Straight from the experts. Including a video. We call it the 3 D’s! Remove DEAD, DISEASED or DAMAGED. Remember this when you look at your roses. Encourage growth on flowering wood. You want new, fresh canes. They produce more and healthier roses than older ones. 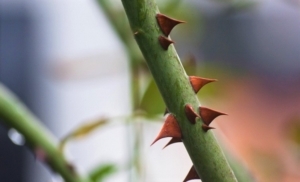 Take precautions to yourself because thorns are very sharp. Scratches and punctures from them can get infected. Having the right pruner is a big step toward making it easy. There are two types of pruners. Anvil and Bypass pruners. We recommend Bypass. Anvil pruners are not as sharp and do not make clean cuts. Bypass Pruner – Our recommendation. Note the curved blades in the illustration below. What makes them effective is that the two curved blades cross eachother while cutting. It’s the key to getting a sharp clean cut. Otherwise you risk injuring your plant. Anvil Pruner – They are not sharp and will tend to rip the cain. You can see the difference as the blade is flat and flush against the back side. Gloves – San Francisco Rose Society, a trusted authority on roses, recommends thick leather gloves to protect you from sharp thorns. For more protection, there is the gauntlet which protects above the wrist. See below. Clothes – Should be thick and hard enough to protect you. Long sleeves are a must. SF Rose Society recommends a leather jacket. Cane – It’s the stem of a rose. It grows from the trunk. A young cane is bright, smooth and green or a mahogony color. See illustration below showing a healthy cane. Old or dying canes are wrinkled and gray. See dead gray cane below. Because of the mild San Francisco Bay Area climate, we recommend pruning roses in February. Our pruning tips are broken out below by three basic types of roses. Climbing roses. And, Floribundas and Grandiflora roses. 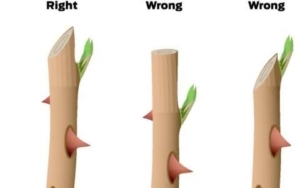 The illustration below shows you proper pruning – how to make the cut. 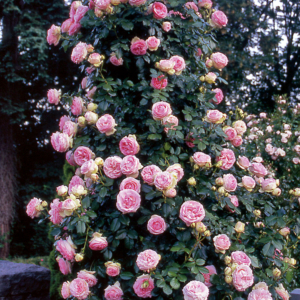 They are the most popular roses in the San Francisco Bay Area and are pruned similarly. The Master Gardener video posted below is a great tutorial on pruning this type of rose. 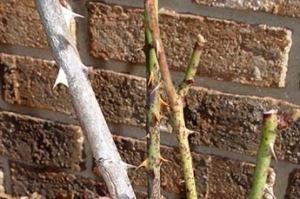 Remove any damaged, diseased, weak or broken canes, until there is only healthy growth. Cut back about one fourth to one third of the current year’s growth. Cut the center branch from each cluster of branches. Cut the remaining ones back to 3-4 undeveloped growth buds. 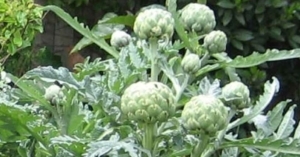 Cut off any stems that are crossing over the center of the bush or crossing over each other. You want the center opened to allow sun and air circulation. It should be shaped like a vase. 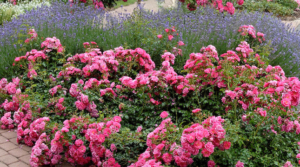 They are also referred to as shrub or ground cover roses. 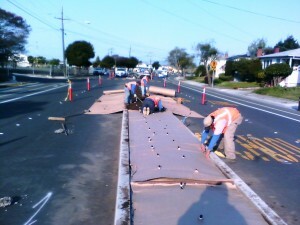 You will see them on many commercial sites in the San Francisco Bay Area. These roses are the least fussy! Remember the 3 – D’s. Cut the bush back to rejuvenate and reinvigorate the plant. You will be cutting it back to half its original size or more. Initially, your plant will look like mere stalks when you are done. But, don’t worry. 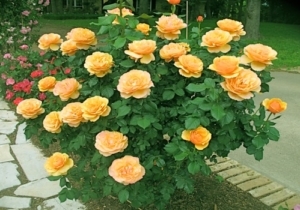 Your rose shrub will re-establish itself with healthy new growth. Finish by trimming so it has an even shape. These roses like to grow against a arbors, fences or a trellis. They key is to train them to a horizontal position. In the shape of a fan. These need to be trained because they have long branches can become quite unruly if allowed to grow in a haphazard fashion. Trim off any old, dead, diseased or overcrowded branches. If a cane is not climbing in the right direction, just remove it. Encourage sidehoots (also called laterals) because they produce the flowers. They should be cut back from two to five buds. Train by bendng the dominant canes to fan out horizontally by securing them. They will produce more flowers! You don’t have to seal your pruning cuts. They will seal themselves, particularly if they are dormant. Remove all remaining leaves. They can harbor pests. Master Gardeners – I viewed several different posts by Master Gardeners including the above video from Oregon. Nanette Londeree, Master Gardener and Master Rosarian who writes articles about the care of roses. San Francisco Rose Society – I used some online information along with their book on roses. Paul Swanson, Gardeners’ Guild, Director of Business Development and horticultural expert. How do your plants look? Are they attractive, healthy and vigorous? There are a few factors that deterrmine how they look. Your plant’s maturity. Are they in the beginning or end of their lifecycle? Are they planted in the right place? This will determine how well they thrive. Maintenance is important. 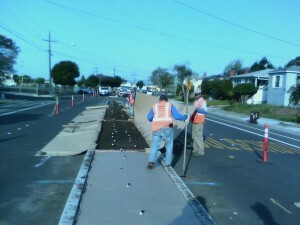 But maintenance cannot compensate for plants that are past their prime or are planted in the wrong place. We have seen numerous examples of plants in the wrong place that, in spite of diligent management, will never thrive. With the right maintenance practices some plants can live for many years. Ten, twenty, thirty and long beyond that. Others have a finite lifespan at which time they will need to be replaced. 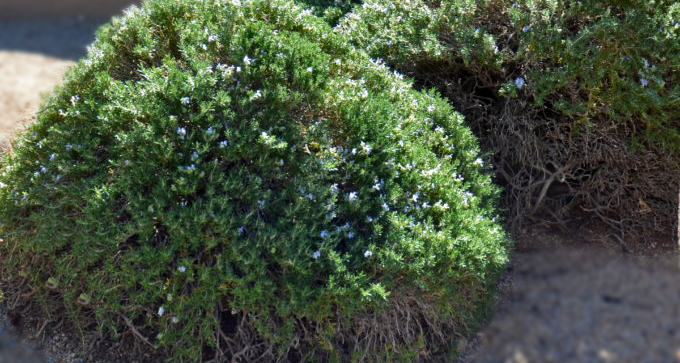 Do you have a shrub that looks awful? Woody? Has it stopped producing foliage? Like the rosemary depicted above? Can your plant can be saved with renovative pruning? Or is it time to replace it? An ugly looking plant reflects badly on your property. You will need to either rejuvenate or replace it. Know which options your plants need depends on their type. Don’t spend your valuable time resurrecting a dying plant when it is better to replace it with a plant or plants that enhance your property. Conversley, replacing mature plants cost money. Make sure you know whether your plants can be rejuvenated. Below are some examples of plants types and their expected lifespan. Their lifecycle is typically one year. And, they bloom consistently. Typically they complete their lifecycle in two years. Plants that live for more than two years. Horticulturalists categorize perennials as to woody or herbaceous. A woody perennias are trees and shrubs. Herbaceous perennials are non-woody plants that that flower during a specified time period and usually die back in the fall. A simple answer is – it becomes unsightly. Some plants that become woody and stop producing foliage should be removed. There are some exceptions – or plants that can be revived. 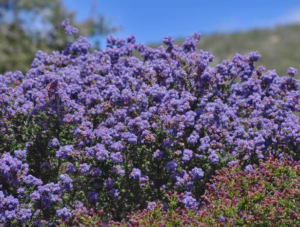 Ceanothus has an average lifespan of ten years. At the very most – fifteen years. You can tell when it needs to be removed when the plant becomes sparse and it looks unsightly. Pruning regularly to remove older shoots will help extend their life. Cistus’ lifespan is approximately ten years. 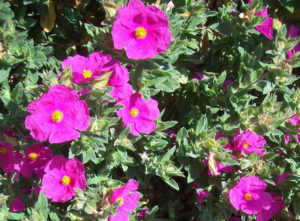 You will know know when it is time to replace your Cistus (Rock Rose). Because it will become very woody and will produce less and less flowers. 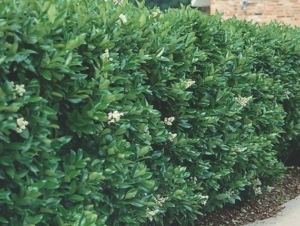 Photinia is usually grown as a hedge for screening purposes. A moderate grower. Reaches maturity in about 12 years. They can live for fifty years – with good care. Pinch and lightly prune 4-5 /year for encourage density. One way of rejuenvating them is to cut back the entire shrub. Another way is to cut back in stages. Privets are grown as trees or heges for screening. They have a long lifespan. Some report 20-40 years. Fast growers, they are hardy and need regular pruning. Renovate by cutting entire plant down to 6 – 12 inches off the ground. Jerry Goodspeed, a horticulturalist for Utah State University says that in the first five years of a landscape, plants grow and fill in their assigned area. Goodspeed says plants may become overgrown. Overcrowding may become a problem. You can tell if they are in decline when they appear leggy. Hard pruning can restore vigor on some. Start evaluating each plant on a case by case basis as some may need replacing. If your irrigation was installed at the same time as your plants were installed, you may be wasting water. Plants compete for nutrients, water and sunlight. Some do not survive. When trees mature its larger canopy may block sunlight from a neighboring plant making its removal necessary. Long term tree care. Routine pruning and fertilization are important for the health of your trees. They are an important part of your asset. With proper maintenance they will last for many years. 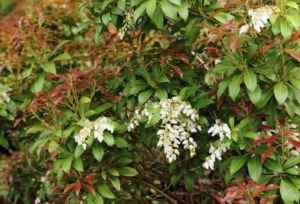 For shrubs that are crowding another plant. A healthier fix than shearing is to selectively remove plants that are crowding each other. Unfortunately, this poor Rosmarinus should be replaced. One of our GGI resident experts, Paul Swanson says, “they do not respond well to hard pruning.” I can guarantee that given Paul’s thirty plus years of experience, that is the last word on it. How do your plants look? Are they attractive, healthy and vigorous? There are a few factors that determine how they look. Your plant’s maturity. Are they in the beginning or end of their life cycle? Jerry Goodspeed, a rejuvenated for Utah State University says that in the first five years of a landscape, plants grow and fill in their assigned area. https://www.gardenersguild.com/wp-content/uploads/gardenersguild-logo.jpg 0 0 sharris2011 https://www.gardenersguild.com/wp-content/uploads/gardenersguild-logo.jpg sharris20112019-01-16 13:47:052019-02-12 23:04:10Should You Replace or Rejuvenate Your Plants?